Sauraha, December 12, 2013 – Elephant Watch Nepal gives kudos to Carol Buckley of Elephant Aid International and Nepal Trust for Nature Conservation (NTNC) and Chitwan National Park authorities for developing chain free enclosures for working elephants. One can only imagine what 35-year old working elephant Man Kali experienced when her chains were removed for the first time after working hours. 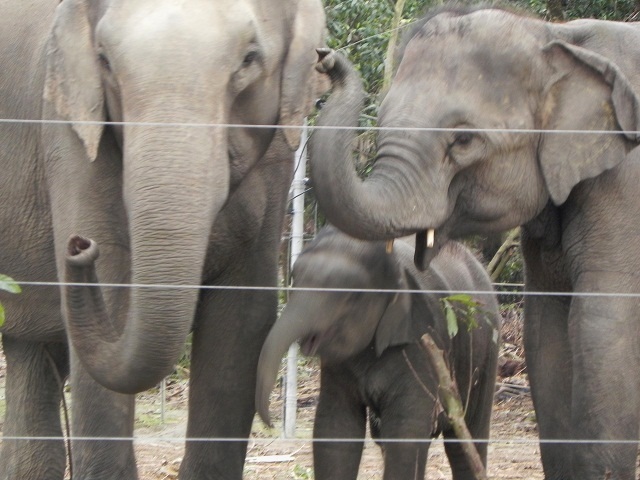 Man Kali and her two children were among the first working elephants in Asia to be rehabilitated in a chain free enclosure, where they can move at will and engage in natural behavior before and after working hours. The enclosure is the outcome of a successful cooperation between the Nepal Trust for Nature Conservation (NTNC) and Carol Buckley, founder of Elephant Aid International. Carol Buckley spent over four decades serving elephants: “What drew me to Nepal is the large number of elephants employed in the tourist industry, their poor level of care and high level of abuse,” says Buckley, who received a 2001 Genesis Award in recognition of her innovative work and was named a Hero for The Planet by Time magazine. Now Buckley is all set to cooperate with Chitwan National Park authorities to build enclosures for the government’s 63 working elephants involved in anti poaching patrol and safari tourism. Click here to read Lucia de Vries’ write up on this important first step to improve Nepal’s working elephants’ welfare conditions.